COUNTLESS HOURS OF FIRE FIGHTING TRAINING AND MEDICAL FIRST RESPONDER TRAINING ... EVERY YEAR! FOR ANY GIVEN REASON  THEY'RE PREPARED TO COME TO OUR RESCUE. ...AND THE WORK THEY DO BUILDING OUR COMMUNITY. The Red Cookbook ~ "Back By Popular Demand!" Yes..... the Red Cookbook is back!! Originally published by the CDFD Auxiliary in 1997 as a fund raising project, this book is an exact reprint of the original (except for making a correction of two). Once again, all proceeds go towards the CDFD Auxiliary and, ultimately, the work and service of the CDFD. 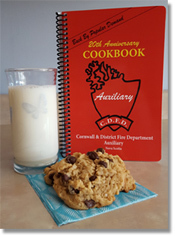 This book will allow another generation of cooks to enjoy the favorite recipes contributed by the Cornwall communities in 1997. Furthermore, this book serves as one of Cornwall's only souvenirs!! At $12.00 a book, this is a wonderful addition to any kitchen (and they make great gifts)! They can be purchased by contacting any Auxiliary member. Some members are listed here. Thank You So Much For Your Ongoing Support!!! Annual Maintenance is Key. Furnaces require regular maintenance by a qualified technician. The National Fire Code of Canada (NFC) states that heating systems, including appliances, shall be operated and maintained so as not to create a hazardous condition. This means "as per the manufacturerâ€™s instructions" and includes annual inspections of both the appliance and the chimney/venting system. As the saying goes  "space heaters need space". The most common contributing factor to fires involving portable space heaters is placing the heater too close to things that can catch fire. Before use, all fuel burning heating equipment, including solid fuel burning appliances, should be inspected each year. If you do not feel comfortable doing your own inspection, cleaning and maintenance a certified professional can help. Please Burn safe! Please respect when domestic brush burning is allowed, allowed with restrictions, or not allowed at all. The map is updated daily and is easy to read. Heating equipment and venting systems should be cleaned and inspected every year by a qualified person. This is important even if you haven't even used your appliance since the venting system was last cleaned and inspected. For more information on Chimney Maintenance, please click here. Restrictions begin at that time for Halifax Regional Municipality and the following counties, Annapolis, Colchester, Cumberland, Digby, Hants, Kings, Lunenburg, Pictou, Queens, Shelburne and Yarmouth. For more information on the weight restrictions, please click here. During the winter season local fire departments can experience extreme conditions and significant snow fall  both of which can contribute to increased hazards in your home. To help keep you and your family safe during winter storms consider the fire safety tips listed here. Most wood burning appliances do not burn wood completely  small pieces of embers and charcoal are left, and, unless disposed of properly, pose a significant fire hazard. Ashes should be stored in a covered metal container placed outside and away from your home and any other combustibles. The only time ashes are safe is when they are completely extinguished. "Every apparatus carries about two or three of the stuffed animals on our trucks", said Joel Campbell, acting captain with Halifax Regional Fire and Emergency. Please obey this law and insure our safe return home to our families. The province of Nova Scotia in a recent amendment to the Motor Vehicle Act has added tow trucks to the list of vehicles you must slow down and move over for when they along the side of the road with lights flashing, rendering assistance.  Chief or Deputy Chief of a Volunteer Fire Department when acting in an emergency arising from a fire or an accident. Imagine the unimaginable. You discover a fire has started in the kitchen of the home you share with your spouse and children. Winter Burning takes place from October 15  March 15. Please check with your local Fire Department before burning; some municipalities require a burning permit year round. We as Firefighters would like to remind our residents to check your smoke detectors and all your safety devices in your home this weekend. If your device is 10 years old, it needs to be replaced. 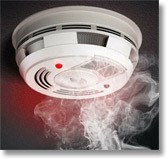 Replace your batteries in both your smoke and CO alarms for the safety of your home and especially your family. 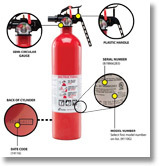 2.7 Million Canadian portable extinguishers recalled by Kidde. On September 1st 2013, Municipal Council's Civic Address Bylaw came into effect, making it mandatory to post civic numbers and private road signs. Without a civic number sign clearly visible, emergency response to yourself and your loved ones could be delayed. Emergency responders rely on a clearly visible posted civic number to find you more effectively and efficiently when you need help. Typically, a number is assigned upon new construction. When the Building Official arrives for the first inspection (footing/foundation), they will assign a number and map (by GPS) the location of your building and this information gets sent to the Civic Addressing Coordinator to confirm and update the civic address system. Renovation and addition projects will also require that you post your civic number, else the Building Official may not be able to issue a final occupancy permit. How to install a civic number sign?  The sign should have a blue background with horizontal white numbering, using reflective materials.  Be posted no further than 1 metre from the driveway and no further than 3 metres from the road's edge.  The sign height shall be no less than 1 metre above the travelled road surface. If a civic sign is not posted property, owners could face a fine of $227.41, and/or the municipality could arrange to post the civic number and place a lien on your property. Existing civic number signs, prior to September 1st, that do not meet the bylaw requirements, will be allowed to remain as long as they are visible. Replacement of such signs will be required to meet the bylaw standards. If you live on a private road, it is required to have a road name sign posted to ensure fast emergency response service. If you are unsure of your civic number, would like to name your private road, are unsure if your road is listed; or have any other questions regarding civic addressing in the municipality, please contact the municipal office at 902.541.1325. If you don't have a civic sign, or require a new one, your local fire department can provide one for you for only $19.00. Simply contact us and we'll do the rest. 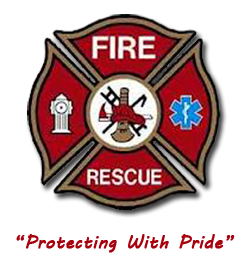 The Cornwall & District Fire Department has 30 trained volunteer Fire fighters who serve the communities of Cornwall and Newburne. We're always pleased to accept applications for new members  fire fighting experience is not a necessity  we will supply training. 10 members are certified Advanced Medical First Responders, and we encourage applications from residents with medical backgrounds  although not a necessity  we will supply training. Members attend a monthly meeting on the 1st Monday of each month and a practice on the 3rd Monday of each month. Training consists of: in-house, mutual aid with other local Fire Departments, Nova Scotia Fire Fighters School and EHS facilitators. The department welcomes applications from all residents that would like to join our team of dedicated volunteers. Please visit our recruitment page for more details and to apply, or contact us at any time for more details. Never been a fire fighter? No problem, because we'll supply the training to make you a great member! Are you interested in becoming a Medical First Responder and have no medical background? We'll supply that training as well! The auxiliary has 13 members that meet several times a year and always welcome new members. Their role is to raise funds for required equipment and provide valued support to our communities through the Department they serve. Learn more about the department's auxiliary and how you can contribute. * The Department is a registered charity and issue Official Tax Receipts as appropriate. Please Note: During emergencies such as lengthy POWER OUTAGES, etc, the fire hall can be made available to residents of this fire district by contacting your Chief or Deputy.